In spite of the fact that many elements enable interaction with your website, HTML forms allow users to send data to the website. While they are quite convenient, creating the code for them can sometimes be slightly tedious, especially if you do not have too much experience in this sense. 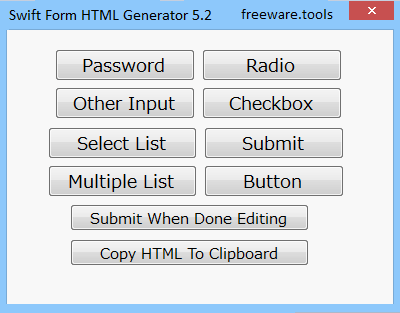 Swift Form HTML Generator is an application designed to automatically generate the code for the HTML forms you desired according to your specifications. In other words and simply stated, you can seamlessly create various HTML elements like buttons, checkboxes or a radio to integrate into your HTML code using this application. The application enables you to create 6 of the most common widgets you can add to your website, namely checkbox, radio, button, text area, select and form. It is necessary to mention that for each of them you can specify only a couple of parameters, meaning the label, name as well as the type or value depending on the situation. Granted, the forms generated via the application are minimal and could probably go well for users that are still learning the ropes of web design. Then again, let us not forget that these elements can also serve as the starting code for a larger project, for instance. The program comes with a very basic interface that consists of 2 main sections, namely the area where you can select the desired form and parameters and the panel where you can preview the code. It is necessary to mention that you can edit the code in the dedicated panel and generate multiple codes at the same time. Generating the code for the desired HTML form entails specifying a few parameters and then accessing submit. On a side note, the application also includes a copy to clipboard function that allows you to quick save any codes you have been working on. In the eventuality that you are looking for a tool that can generate the necessary HTML code for the simple forms you want to add to your website, then Swift Form HTML Generator might be worth trying out.